Feather hair extensions are being sold as a fashion ornament, but what is the reality behind these feathers? Do ornamental feathers just “fall off” the birds? The answer is No. Hair extension feathers are obtained from caged roosters who are raised for this purpose in filth and misery. The largest American supplier of these feathers is Whiting Farms in Colorado. According to the company: “Each rooster has only a small number of tail feathers that can be used for sales – sometimes none, sometimes 5 or 6.” Up to 1,500 roosters may be killed by Whiting Farms each week for the fashion industry. The dead roosters are then trashed like garbage. “They aren’t good for anything else,” bragged company president Thomas Whiting, showing the cruelty and waste of the feather business. Whiting Farms lies to the public. They do NOT kill their birds “humanely.” They do not “euthanize” them. To keep blood off the feathers, Whiting Farms and similar companies asphyxiate their birds with Carbon Dioxide. Carbon Dioxide (CO2) inflicts a terrible death. Roosters killed for feather hair extensions die in painful agony while they suffocate in terror. The roosters panic as they realize they cannot breathe. Every inhalation to try to get oxygen and expel the poisonous gas from their lungs tightens the strangulation. This is the torture that Whiting Farms and its competitors put innocent birds through merely for a trivial hair ornament. 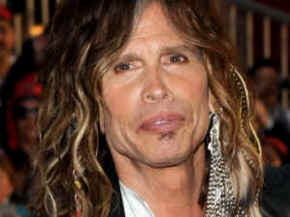 If you are wearing feather hair extensions, please stop wearing them. 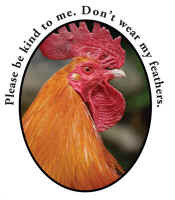 Give the feathers a decent burial and tell your friends why you are no longer wearing them. If you are thinking about buying a feather hair extension or any other feather or “down” product, please don’t. There are many beautiful feather-free fabrics, beads and other ornaments you can buy, or even make yourself, that don’t come from suffering and abused animals. If you see anyone wearing feathers braided into their hair or buying or selling “feather hair extensions,” politely inform them that roosters are being raised in filthy warehouses, cruelly gassed to death, and thrown away like garbage, merely for a few feathers from each bird’s body. Educate fashion and teen magazine editors, store managers and others about the terrible suffering and death these poor birds are enduring merely for a fashion item that can easily be made from cloth fabric. Urge store managers to stop selling feather hair extensions. Carry these pamphlets with you to hand out. Order 10 for $1.00. 25 for $2.50 from www.upc-online.org/merchandise. Or send check or money order to the address below. Thank you for choosing compassionate fashion!